i Click 'view all' to instantly compare this wait with offers on other top water heaters. 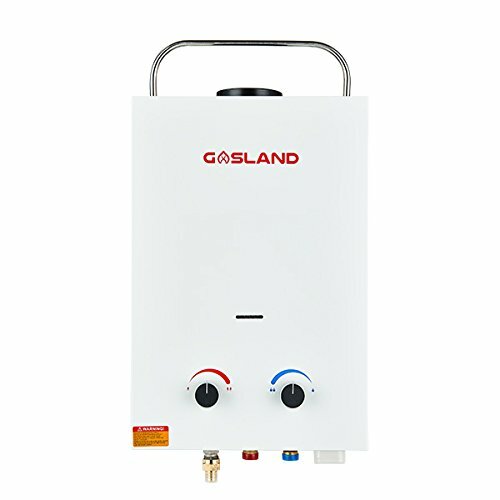 Gasland 1.58GPM 6L Portable Propane Gas Tankless Water Heater is currently selling at $129.99, approximately $8.60 higher than average. With a lowest price of $119.99 and an average of $121.39 it is selling on the high end of its usual range. Price volatility is 0.59% (meaning it does not change often), so you might have to wait a while for the price to drop. Right now this product is a recommended 'wait'. There is a coupon available for an additional 15% off. 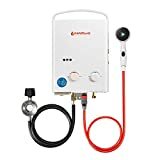 Compare the current price, savings (in dollars & percent) and Buy Ratings for the top Water Heaters that are closely related to Gasland 1.58GPM 6L Portable Propane Gas Tankless Water Heater. Here is how Gasland 1.58GPM 6L Portable Propane Gas Tankless Water Heater compares with other leading Water Heaters. 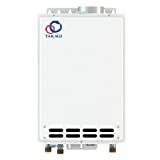 1,The best solution for outdoor hot water, perfect for camping, RV life or anywhere you need hot water.2, Works easily with low levels of water pressure. Applicable water pressure: 2.18 - 145.00 PSI.3, The operating propane gas pressure is 0.4PSI with maximum power output 41,000btu/hour.4, Energy-saving design heats up in seconds and uses gas only while water is flowing.5, No electricity needed, works with 2 "D" cell batteries(not inlcuded).6, Endless hot water bliss is better than a traditional storage tank.7, Use brackets to hang, carry handle folds down for easy storage.8, Excellent solution for homes with frequent power outages.9, The gas water heater can't be used for drinking water.What's in the Box?1 x BS158 portable gas hot water system.1 x instruction manual.1 x 5 feet CSA approval regulator & gas hose.1 x garden hose: 1/2" BSP Female X 3/4" GHT Male.1 x garden hose: 1/2" BSP Female x 3/4" GHT Female.1 x gas inlet connector: 1/2" BSP Female x 5/8" NPT Inverted Flare Male.1 x 3 setting ON/OFF shower head and pedestal, includes 5 feet shower hose.1 x accessories package(fixing kits includes water tape, wood screws, washers).Easy to use1, Securely hang your water heater using fixing kits.2, Insert 2 "D" cell batteries(not inlcuded) and be sure the polarity of them are correct.3, Connect the gas inlet with supplied gas regulator.4, Connect water inlet with a standard garden hose, and connect water outlet with shower hose and shower head provided.5, Adjust the water and gas knobs to get ideal temperature as you want.6, Now enjoy the instant endless hot water.Inquiry & aftersales service: gaslandna@outlook.com FeaturesCompact and lightweight design for easy portability.Low water pressure start up, just need 2.18 PSI of water pressure.1.58 gallons per minute of on demand hot water. Fully adjustable heat and water flow.Flame failure device, anti-freezing protection, over-heating shutoff protection.